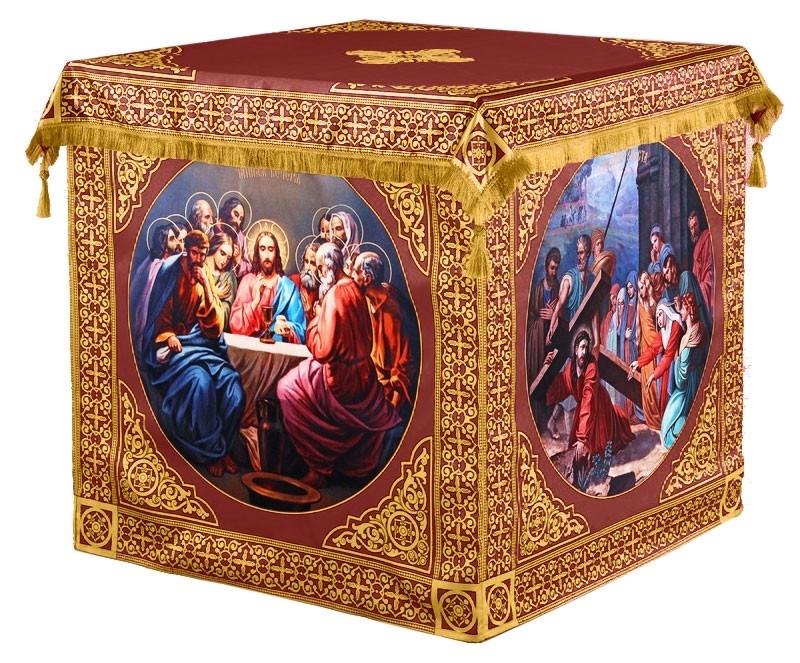 Orthodox Church liturgical Holy table vestments (claret-gold) by Istok Church Supplies Corp.
Is your Orthodox Church Holy Table vestment showing signs of wear and tear? Are you outfitting a new church and looking for a high quality Holy Table vestment to start with? 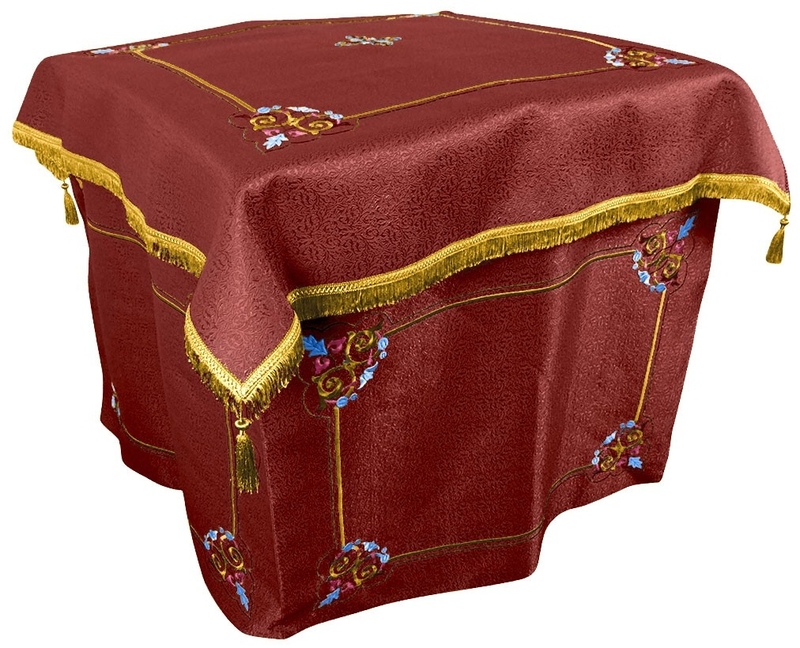 No matter what your needs are, we have you covered with top class Holy Table vestments in different liturgical color combinations including claret-gold. 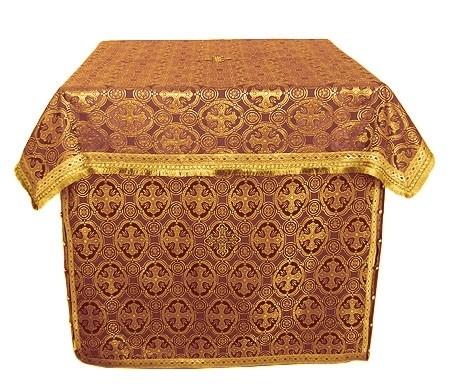 Claret-gold Holy Table vestments draw the attention of church goers and help them have a strong spiritual experience. Claret-gold Holy Table vestments are a good choice for Nativity and Apostle lents and commemorating The Holy Cross among others. We offer these vestments in rich ecclesiastical fabrics such as rayon brocade, metallic brocade and natural German velvet. Vestments made from brocades feature intricate patterns and customers have the option to purchase a product as it as it ask for it in a different fabric belonging to the same class. 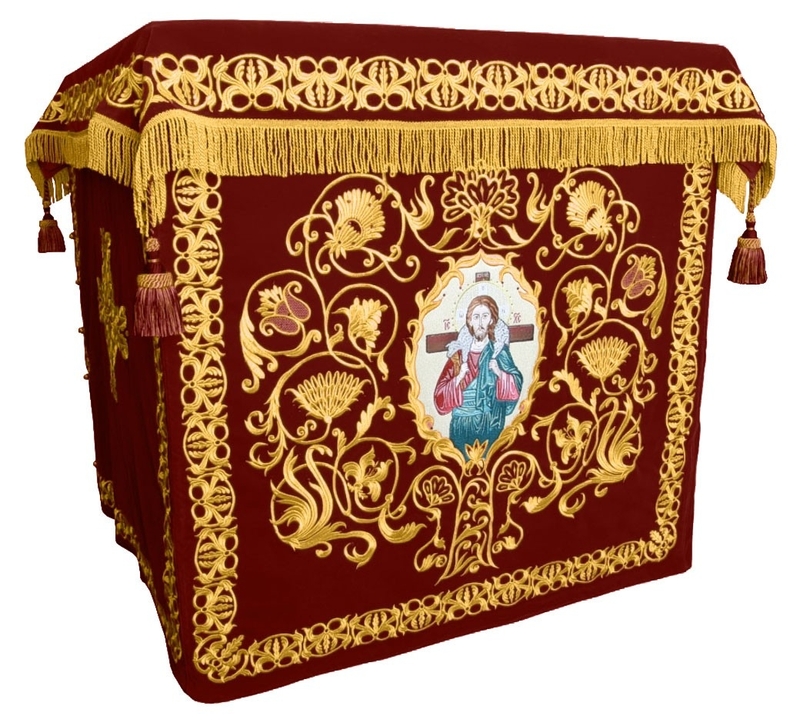 Claret-gold Holy Table vestments crafted from natural German velvet feature elaborate embroidery painstakingly rendered by our dedicated embroiderers. Many of them feature beautiful Christian themed embroidery which makes one feel humbled and closer to God. If you’re looking for a Holy Table vestment that bears witness to the Glory of God, we have it for you in our superb collection. We provide standard decoration for Holy Table vestments and customers can upgrade to premium decoration by paying applicable charges. We are renowned for the unbeatable browsing experience, secure ordering process and efficient delivery services we provide. Everything is systematically organized to help customers quickly find what they are looking for. Added to this is our loyalty program which allows customers to earn cashback bonus points which they can redeem for price savings on future purchases. While offering high quality products, we try to keep the pricing as affordable as possible. We have considerable experience in supplying traditional Orthodox Christian goods including custom vestments. Go ahead and purchase confidently knowing that you are investing in a quality product that will enhance the prestige of your church! The Greek riasson I received in Rayon is cool and lightweight, despite being of very solid and sturdy construction. Again, it fits great and looks amazing. Thank you so much! I'm sticking with Istok!